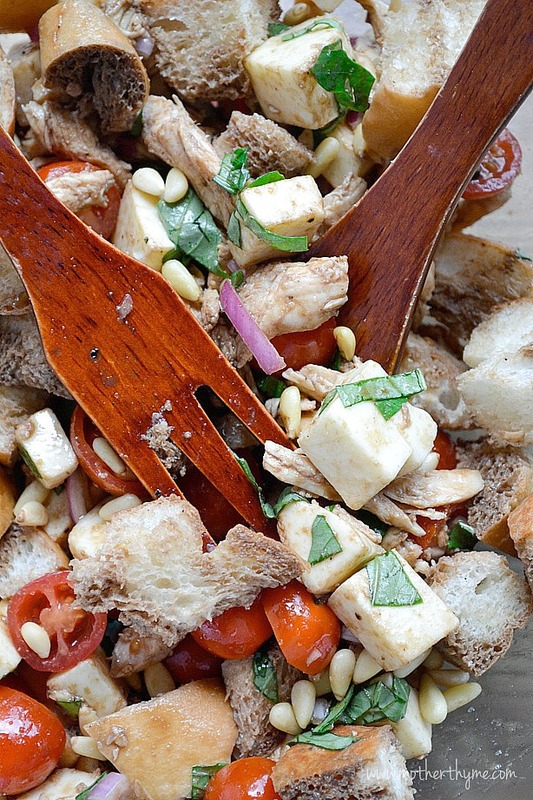 This Chicken Caprese Panzanella Salad is like summer in a bowl. 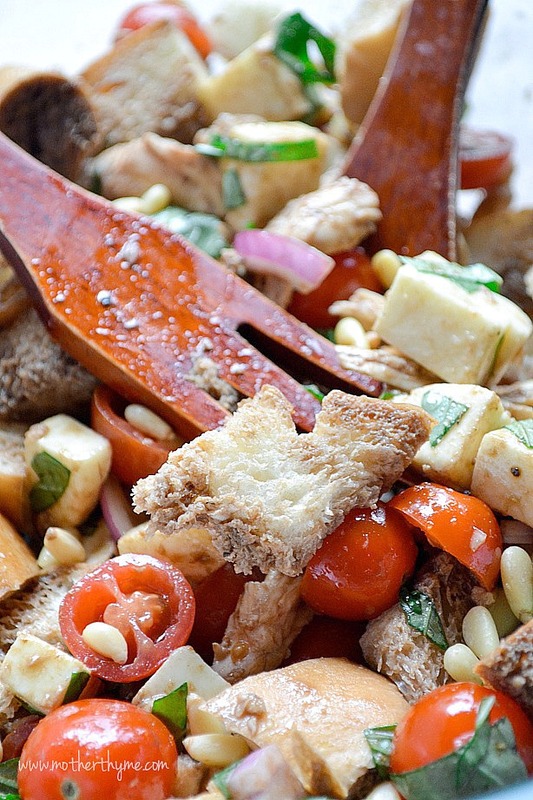 Panzanella Salads are delicious salads mixed with chunks of Italian bread. They are great in the summer tossed with all the veggies you can pick up at the market. 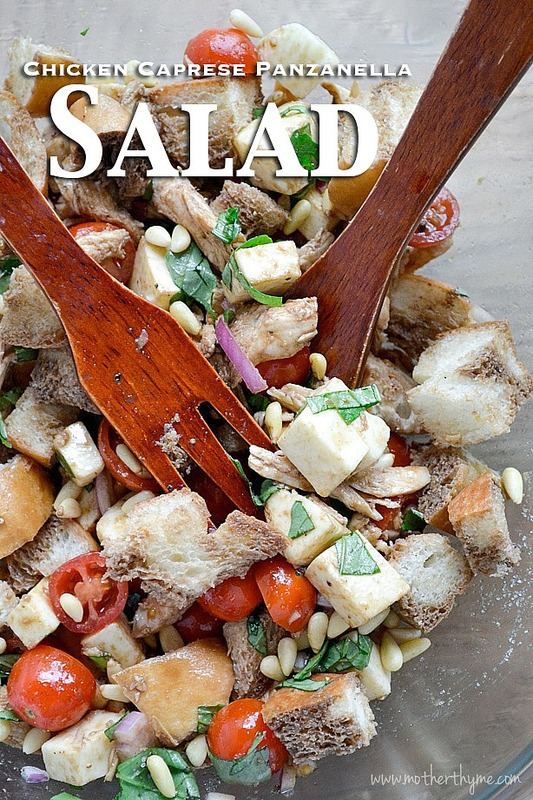 I make a variety of Panzanella salads. Often I just use whatever I have on hand. I’ll purchase a loaf of Italian bread at the grocery store and cut it in thirds. I’ll use one and freeze the other two halves for later that way I always have some bread on hand to whip up this salad. A cute way to serve this salad is in mason jars. Great to take and pop in the cooler if you are out and about for the day, or having a picnic in the park. We go camping every weekend, so I enjoy making this salad in mason jars, and we can sit back in our lounge chairs and nibble on this salad. I just recommend tossing it with the dressing right before serving so the bread doesn’t get too soggy. I usually have some cooked chicken on hand, but if I don’t I’ll pick up a store bought cooked rotisserie chicken and cut it up. It makes it so much easier on those busy summer days when you just don’t feel like cooking too much. Add your chicken to a large bowl, with bread, sweet cherry tomatoes, mozzarella cheese and little onion and garlic, and lots of fresh basil. Toss in a quick and easy dressing and this yummy salad is ready to serve. 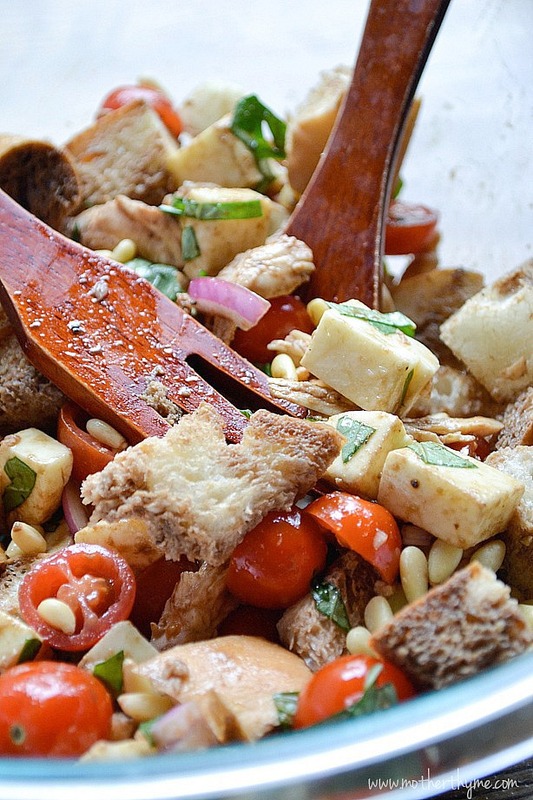 In a large bowl toss chicken, tomatoes, cheese, onion, basil, pine nuts and garlic with bread. In a small bowl mix balsamic and dijon. While stirring, whisk in extra virgin olive oil. Toss salad with dressing right before serving. It is recommended to use block whole milk mozzarella instead of fresh mozzarella. There is more moisture in fresh mozzarella and the salad could get soggy if you fresh mozzarella, especially if you are not serving it right away. If you are serving it right away you could use the block mozzarella which is shown in this salad, or boccocnicni, small little mozzarella balls. Just pat them dry with a paper towel first before adding them to the salad. The pine nuts add a little crunch to the salad. You can toast them in the oven for a few minutes on baking sheet if you prefer as well.